So it’s already the end of February and I am JUST now kicking off my first big home project of the year. Where has time gone? This year is already flying by eeeek! 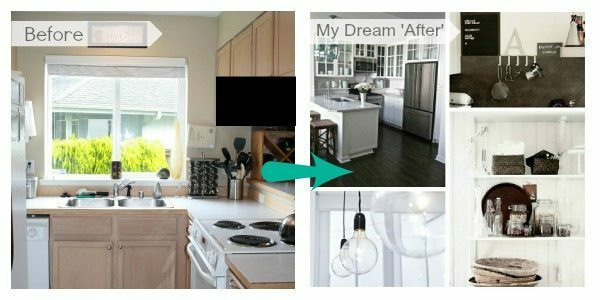 Anyway, if you remember my Home Goals from this year, the first big project on my list is our kitchen makeover. Yes, it is finally happening. 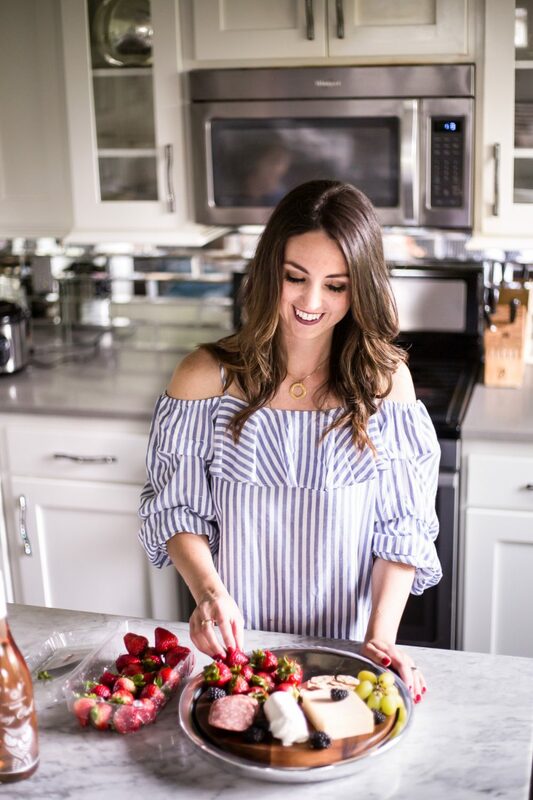 Our kitchen is probably the only space in our home that we have done virtually nothing to over the years and it’s the space that’s always needed the most help. Since we’ve been married I’ve painted the walls to cover up the green ivy stencil that just wasn’t my style, and we added new hardware to the cabinets to freshen the look, but that is it. It is definitely in need of a facelift to make it more our style. And let’s talk size. Size does matter when it comes to a kitchen and it just happens that our kitchen is literally the smallest space in our home. Like, it’s only big enough for one person to be cooking in there at a time. If we were planning on staying in our home for the rest of our lives, then we would definitely be making structural changes to make it bigger. BUT, for now this will just be a facelift and I am more than happy with that. In fact, I’m ecstatic. 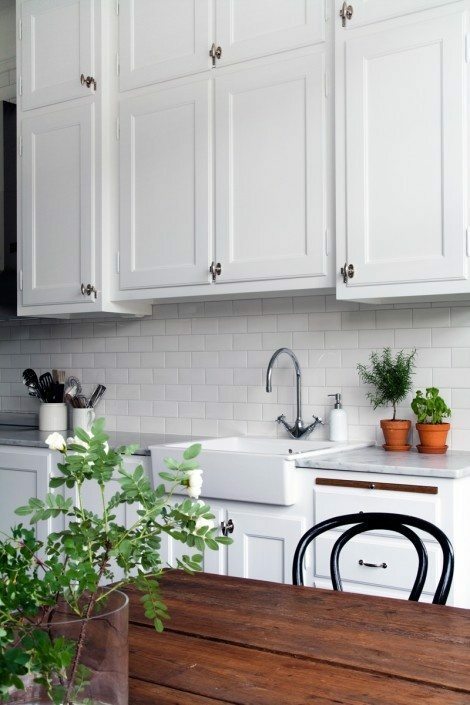 I have always dreamed of having a crisp white kitchen but I have always been scared of painting my cabinets. But after seeing so many success stories I’m ready to dive in. 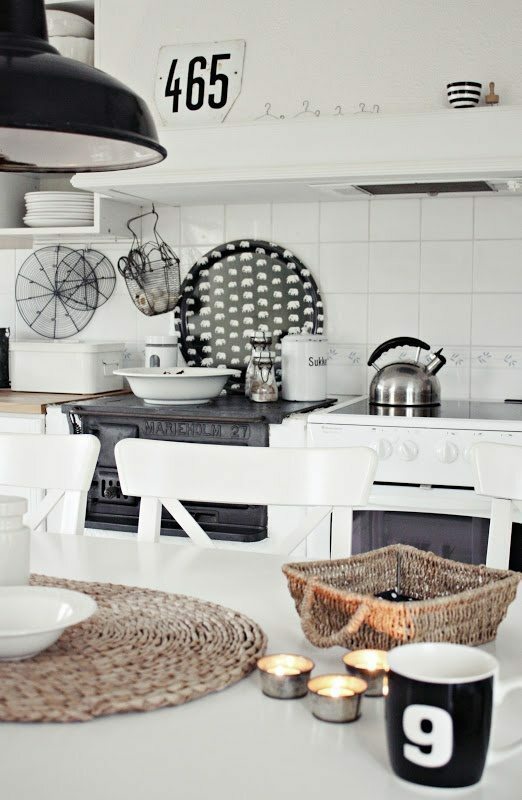 Today, I’m sharing some of my inspiration photos for the new look we are giving our kitchen. 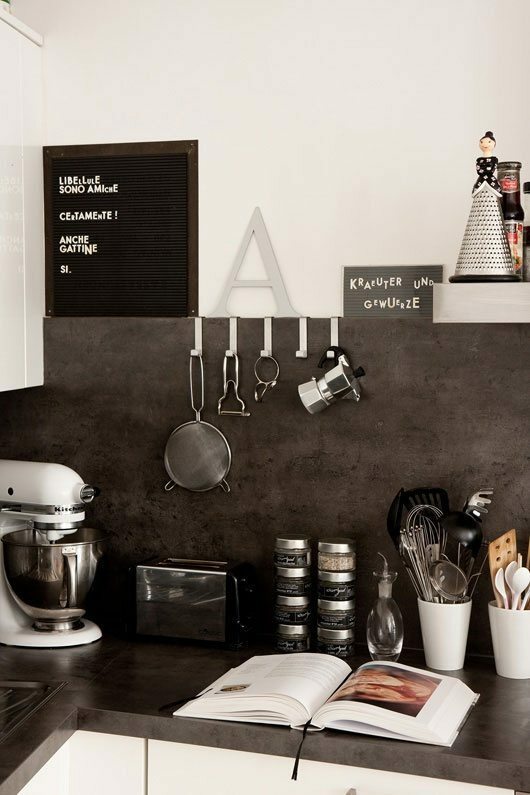 This kitchen gives me so much inspiration and motivation for our kitchen makeover. The kitchen above is almost identical to my current kitchen in both size and layout (You can see a peek of my before picture above). The clean and fresh look of this small kitchen makes me believe that I truly can transform our space! 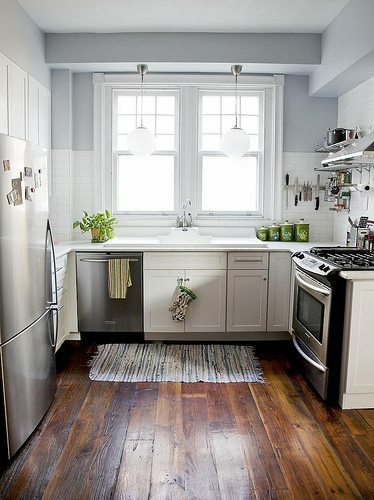 The photo above has the overall look I would love for my kitchen, dark floors and white cabinets and really clean. There is so much about this picture that I love. While I tend to lean toward all white kitchens, I do really like the contrast of the darker counter tops and walls. This makes me really want a chalkboard wall! Let’s talk open shelves. I’m not sure if they are the most practical feature in a small kitchen, considering we need all the storage we can get. But, they are simple gorgeous. If everything goes as planned, I WILL have a set of open shelves somewhere in our new space. I’m determined! 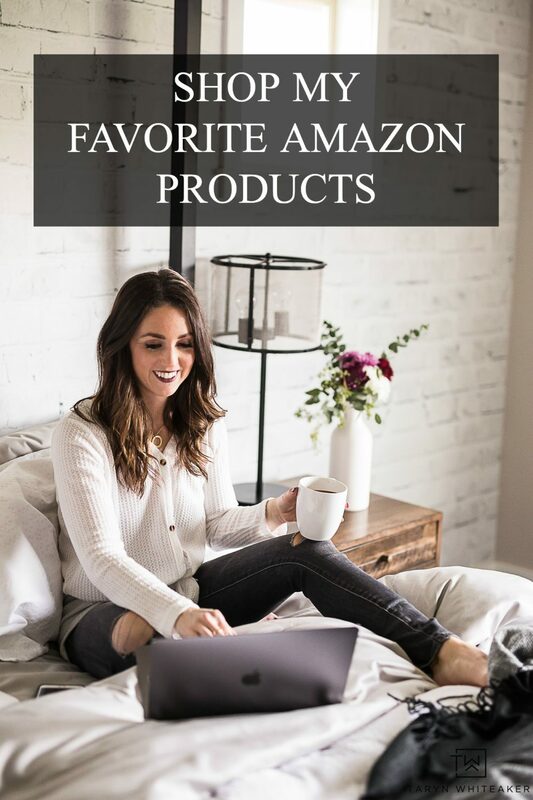 Do you love them or hate them? I also really like the pendant light in front of the window in this picture. Right now we have a recessed light and I would really like to turn it into a pendant.Vintage glass or wire light maybe? Our kitchen blends into our family room, so I’ll be incorporating more rustic/vintage elements to keep the look consistent with the rest of our downstairs. You can view all of my inspiration photos here. Ok, I’m now reallllly anxious and excited to get started. Writing this post actually made it feel real. Ahhhh here we go! What are your favorite elements from the pictures above? Any advice on painting cabinets? Just in case you didn’t know this, Lowe’s has a pendant light kit that allows you to leave the recessed light installed but change it into a pendant! Its what we plan to do with a couple lights in our rental home. Can’t wait to see the finished look! Oh and I love the open shelves! 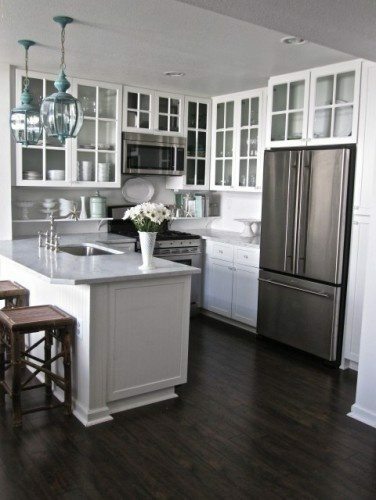 I looove white kitchens! That is the first thing I did when we moved here – paint our cabinets white! 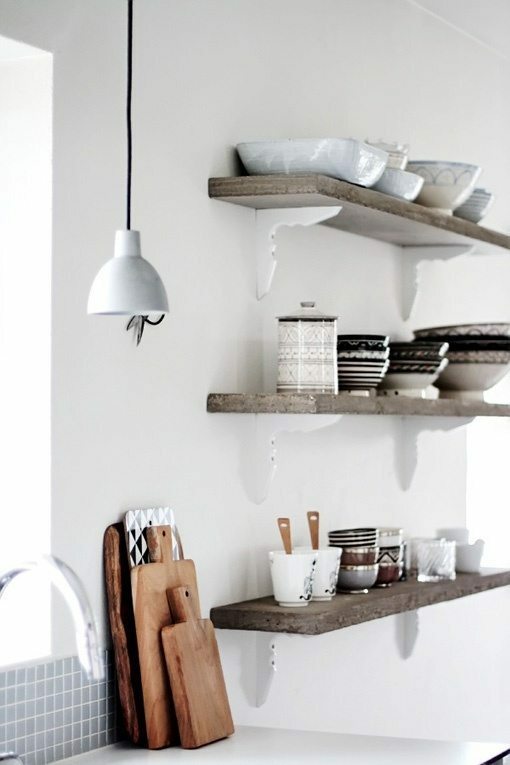 I also love the open shelving trend but I know that mine would always be a disaster, lol!! Can’t wait to see what you do!! OH how envious I am but very happy for you. Having a white clean looking kitchen is one of biggest things I’d love to have. Your kitchen is great compared to ours. But then don’t we all want something different? Our countertop is in shape of a horse shoe. UGH!!!! Cheapy white counter that is lifting up and the stuff on the edges is coming off. UGH!!!! Whomever ordered kitchen design like that I’d like to throttle. Their idea of wall panels is not to my liking at all. We have a 16×80 single wide mfg. home and the walls are panels with vinyl paper covering them. The kitchen cupboards are the slick contact covered like paper on pressed wood. Not in budget to replace them but I’d be happy to be able to paint them. The quickest way would be to spray them. I hope you get to have your awesome kitchen very soon. I’ve been waiting for 6 1/2 yrs. just to get the walls painted. I’d love to tear up carpets in our room and living room at least. Maybe some day when hubs is gone long enuf I’ll start ripping it out. I saw some nice affordable remnants of carpet bolt ends at Lowe’s. Just have to have one sized for our living room, affordable and so much nicer. Our house was built in’ 98 so has really dated things in it. I’d love to have glass in upper kitchen cupboards. Love idea of open shelving. I’d do that in a heart beat but we have so much dust here my dishes would be yucky all the time. Go for it. Will be watching to see how your kitchen turns out after your remodel. Good luck. I have the first photo you shared on my pin board too as to how to redo my kitchen which I am also shooting for all white! I already have 6 open shelves as cabinets and really like them. It helps me not accumulate too many things I do not need :) We have a very small kitchen and I think open shelving helps open the space visually. Looking forward to your cabinet painting tips! Also, our cabinets are from 1950 and we have no idea how to get them off the wall to refinish? ?